This weekend was the first EUMC trip of the year which was heading to Glen Coe. There were quite alot if us so we had booked out both the Alex Macintrye hut and Manse Barn. 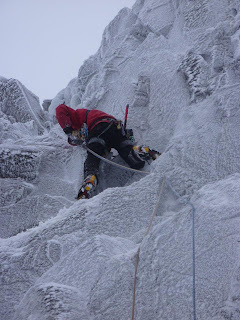 On Saturday James, Hugo, John, Chris and I got an early start and were walking into Stobe Coire nan Lochan by 6.30. It was pretty warm in the glen and the snow level was quite high but once in the snow things seemed to solidify pretty nicely. Our target was Central Grooves, just like everyone else we talked to that day. It was however looking quite black. Most of the coire looked black except for parts of summit buttress. The obvious ramp of Scabbard Chimney (V 6) looked good so we headed over and geared up. There was some unconsolidated snow in the chimney but other than that it wasn't in too bad nic. There were some fun little bridging moves on the second pitch, I'm starting to come round to the idea of bridging now, and all the belays were insitu, which was handy. On the second belay we were joined by a pair on Spectre. One last pitch of hard climbing and we decided to make use of the insitu abb point and miss out braving the strong winds on the summit. Other routes climbed that day were Twisting Gully, NC gully, Boomerang Gully and Dorsal Arete. After another 5am start on Sunday I met up with Tom Challands and went to climb Crypt Route (V 6) on Bidean nam Bian. Things were looking pretty bad on the walk in with a waterfall coming down a line on the left of Stobe Coire nam Beith, but we pressed on as we'd already come a long way. Most of Church Door butress was looking black but there was some good ice in the gully of Crypt route. Tom lead the first pitch and belayed inside the deep chimney. It didn't feel too bad to second until I got my boot stuck! I lead most of the rest of the chimney but belayed in the cave before the 45cm hole. The route finding wasn't as bad as expected and I only went up one dead end. After the hole, which Tom only just fitted through, we followed a thinly iced flake route to the top. The rest of the group either went walking or to Stobe Coire nan Lochan were Raeburn Route and SC Gully variation were climbed. Twisting Gully was apparently rammed and Twisiting Gully Right Fork looked thin. The Aonach Eagach ridge was looking good too. Check out Toms blog for his take on the day. Love the last pic - feel cold looking at it :) Good to read, like a post-card to soggy Surrey.